Hong Kong is a fusion city of note. It is rich in its ancient Chinese heritage, yet deeply impressed by its British rule. It’s where I spent a few days last month, and became overwhelmed by its buildings and people. Towering skyscrapers reach for the skies, creating a glassy skyline that dazzles. The waters of Victoria Harbour separate Hong Kong Island from Kowloon, both sides teeming with activity. 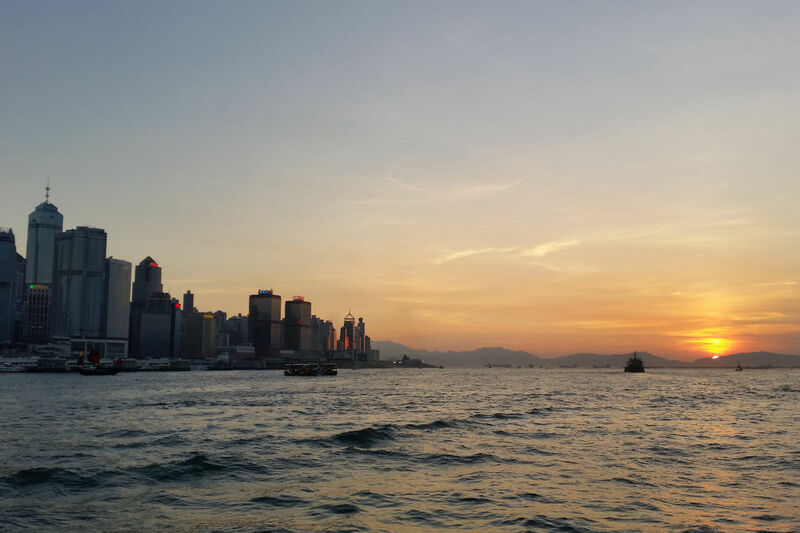 On my first evening, I caught a short ferry across the harbour, and was treated to a golden sunset. A large crowd had gathered on the Tsim Sha Tsui promenade to watch the nightly light show that added more sparkle to the glitzy scene. It was just any other day, and the large crowds was simply a feature of life in Hong Kong. Malls, parks, public transport – everywhere seemed to be busy with people. Queues would form to use elevators, everyone waiting their turn patiently. The term mass transit took on a whole new meaning there. Hong Kong is known to have one of the highest population densities in the world. With the limited space on the few islands that make up Hong Kong, monolithic tower blocks house the majority of the population. Being granted a special administrative status after the British handover back to China (it has its independent legal system, albeit with Beijing’s influence increasing), Hong Kong’s popularity has not declined. International fashion brands line up modern shopping streets and mega malls. 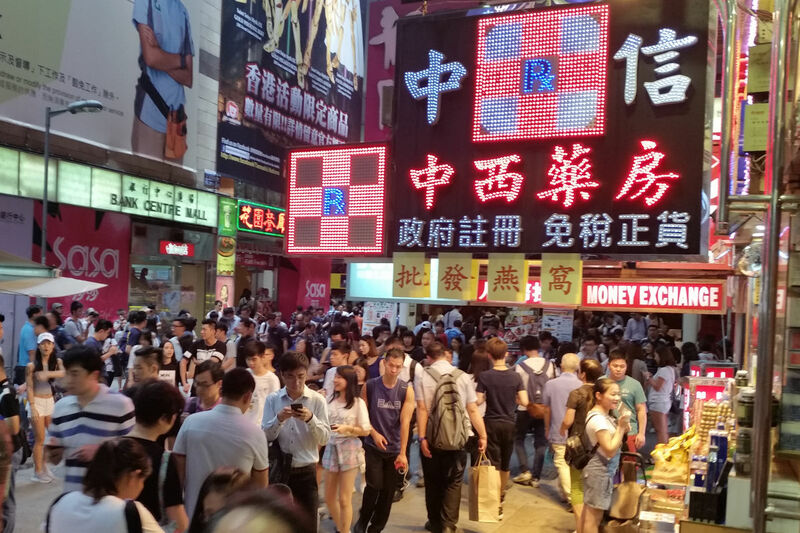 Not far away, there’s a buzzing atmosphere in the crowded streets and stalls of Mongkok. This dense “China Town” neighbourhood is especially lively in the evenings. Hoping to escape at least some of the crowds I took the Peak Tram to the top of Victoria Peak. There I went for a leisurely stroll around the summit, taking in the panoramic views of the city and harbour. From that vantage point, it was refreshing taking in the sheer scale of Hong Kong, without being overwhelmed by crowds. 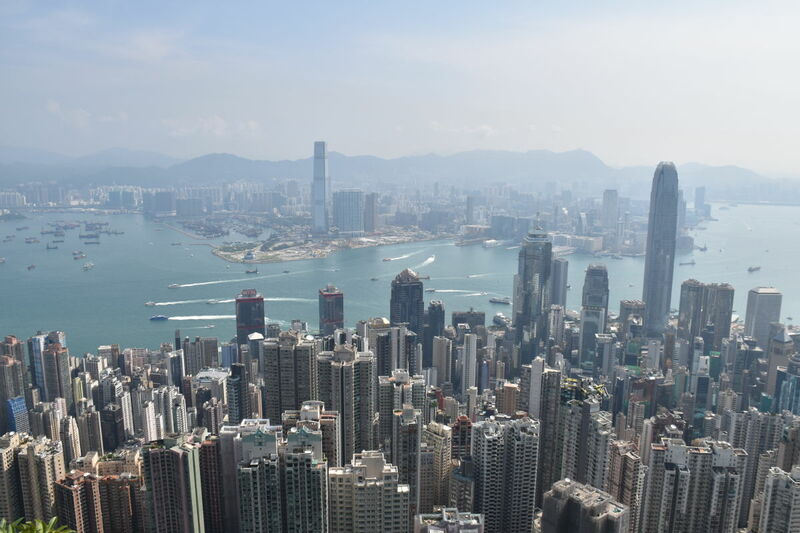 Hong Kong is made up of a few islands (the most popular being Hong Kong Island), and the Kowloon Peninsula (which is attached to mainland China). Getting around by public transport is easy. Tourists can get a special “Octopus” card at stores such as 7 Eleven, where you can also top up the card. The card can be used for public transport, or as a debit card at some stores. You can skip the long ticket queue to buy tickets at the Peak Tram if you have an Octopus card with sufficient money loaded. But you will still need to wait in a queue to board the tram. Get there very early to avoid the hordes of group tourists. The circuit walk around the Peak is a refreshing break from the city, and takes about 90 minutes. 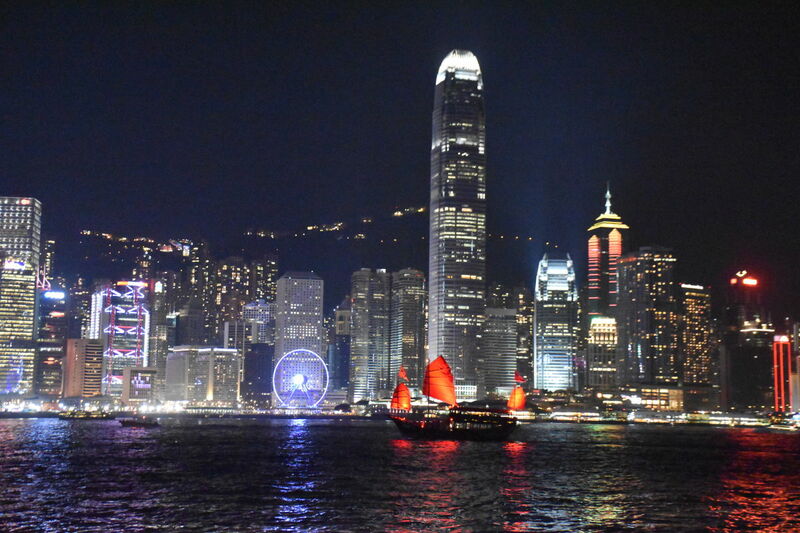 There’s a daily (free) sound and light show at 8pm along both sides of the Victoria Harbour waterfront. 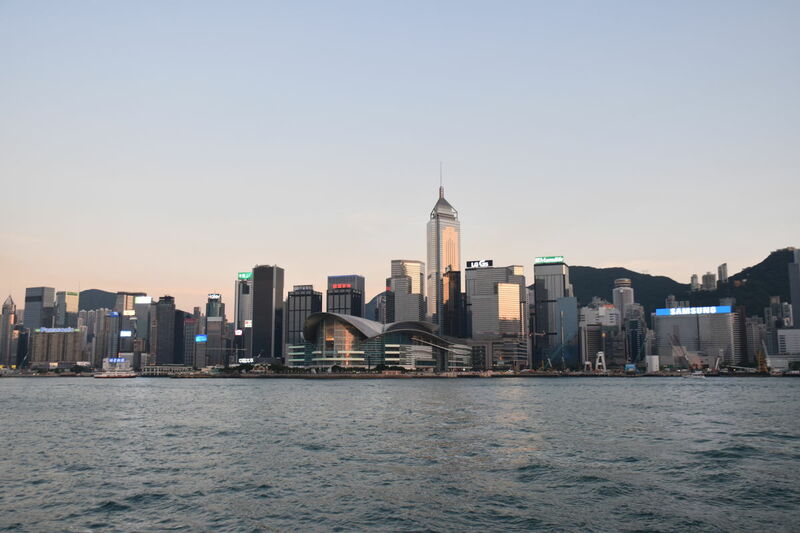 The best views are of Hong Island’s skyline, seen from the Tsim Sha Tsui promenade side. The Discover Hong Kong website has some useful information for tourists.